Dengue cases, which can be highly lethal to children, rose phenomenally in the first five months this year and more than doubled compared with the same period last year. The Ministry of Health, in a statement released yesterday said that from January to May this year there were 1,915 cases and four deaths. Last year, the ministry said, there were 567 cases with one death. The statement said dengue cases normally peaked after a cycle lasting three to five years and this year more cases are expected due to the abnormally high atmospheric temperatures associated with intense El Nino events. Health Minister Dr. Mam Bunheng urged Cambodians to exercise strict caution during the rainy season to prevent themselves from being bitten by the Aedes mosquito that carries the dengue virus. In the statement, Dr. Bunheng said parents should ensure the surroundings of their houses were kept clean and all mosquito breeding areas destroyed to eliminate the Aedes larva. This is to prevent children from getting dengue, he said in the statement. 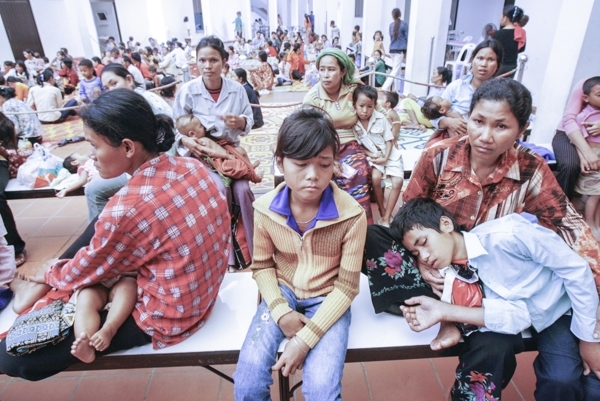 Children are susceptible to dengue and often succumb to dengue hemorrhagic fever if there is a delay in seeking help from health centers or hospitals. There is no treatment for dengue and generally the fever resolves on its own with the help of intravenous fluids. “Please rush your child to the nearest health center if he or she has high fever because dengue can kill,” said the minister. Dr. Bunheang said the larvacide Abate was the most effective in eliminating the Aedes mosquito in its breeding sites, with the Abate pellets put in water jars and containers – the mosquito’s favorite breeding places. Secretary of State at the Ministry of Health Dr. Eng Huot issued a directive letter to all provincial and city health department directors to take action in preventing dengue outbreaks. Dr. Hout ordered all provinces to put Abate in water jars and all water containers. The director of the National Center for Parasitology, Entomology and Malaria Control, Dr. Huy Rekol, could not be reached for comment yesterday. Director of Kampong Cham Provincial Health Department Kim Sourphirun told Khmer Times yesterday that the department gave the larvacide Abate to all the province’s nine districts. Each district, he said, received one ton of Abate for killing the dengue mosquito larva. Mr. Sourphirun also said supplies of serum had also been prepared for intravenous use in emergency cases of dengue hemorrhagic fever.